You are gonna love these balls. 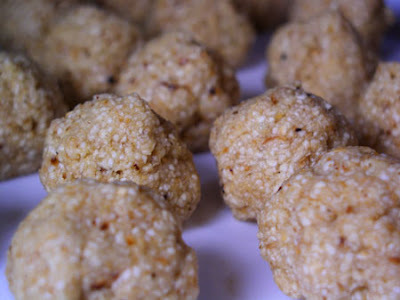 Featherballs are essentially matzo balls, but are unique in the fact that they are flavored with nutmeg or ginger. My friend and cohort Ilana pointed out that ordinarily in matzo ball soup, it’s the broth that is the most flavorful, and the matzo balls added as filler. In this recipe, the flavor of the matzo balls are brought to the forefront. Additionally, these balls do have a light and fluffy texture–but we’ll get to that in moment. most New York matzo balls are fist-size, like the ones you’ll find at Katz’s or the 4th Ave. Deli. These featherballs were to be rolled the size of walnuts. Their are also two types of matzo balls–the light “floaters” and the dense “sinkers.” Neither are wrong, just a personal preference. We whipped the eggs and the schmaltz until each were fluffy, then combined them and added the dry ingredients. We split the dough between two bowls, and flavored half with nutmeg, and half with ginger. The dry ingredients were added, and mixed by hand until just combined. Jed warned us that over mixing the ingredients would result in a matzo ball as hard as rock. Jed also said that with most matzo ball recipe, you let the batter chill first, and then roll the balls. In the recipe, you roll first and then chill. We shrugged and followed the recipe. 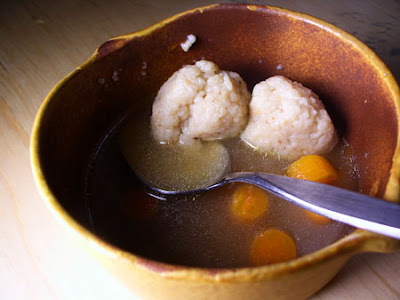 While the matzo balls chilled in the fridge, Jed cooked some carrot slices in chicken broth. 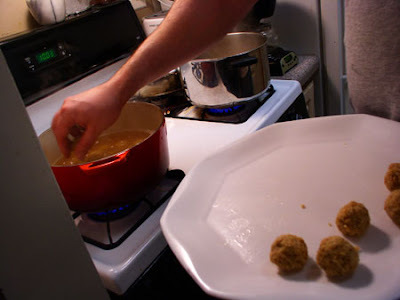 We used boxed broth, but one of the cool things about this recipe is it written for a home cooked soup: you would make you soup, skim the chicken fat off the top, add the fat to the matzo balls, and cook the balls in the soup. Jed also noted that the carrots are essential; they help to break up the saltiness of the broth and the matzo, and gives your palette a rest. 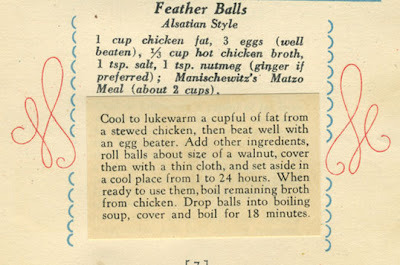 The featherballs are dropped into boiling chicken broth. When the broth came to a rolling boil, we dropped the featherballs in and covered the pot. 18 minutes later they were done. Be careful not to cook them too long–they begin to fall apart in the water. Some may be a little underdone in the middle, which is fine. We turned off the burner and served us up a bowl of featherballs. I have to admit, I have no basis of comparison, these being perhaps the second matzo balls I’ve had in my life. But I did think they were really good. Jed and Ilana have grown up on matzo. The three of us agreed the texture was great–Jed and Ilana said much less dense than an ordinary matzo ball. It was light, but also very hearty. After eating four, we were full. We couldn’y taste the ginger in the featherballs, although they were still salty and good. The nutmeg taste was present, and they were deigned the favorites by Jed and Ilana. For me, it was hard. I associate the taste of nutmeg with dense cakes of the 1850s, and it was difficult to get out of the mindset. We speculate that mace (the spicy out shell of a nutmeg) might also make a good featherball. In the coming weeks, we plan on doing one more Jewish cooking day based on our Manischewitz cookbook. Ilana and Jef will handle savory dishes (pumpkin pancakes, tamales, asparagus wheel) and I’ll attack sweets (boston pie, orient cake, farfelroons). I will keep you updated as to our progress. I’m embarking on a new project with my friend Ilana. 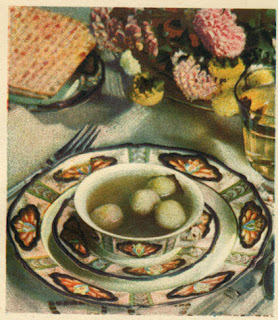 While at her bubbe‘s for Passover, Ilana came across a Manischewitz Matzo Meal cookbook from 1930. 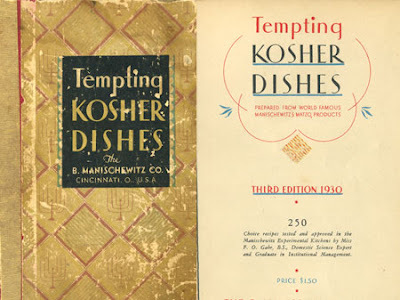 It was printed both in Yiddish and in English, and the recipes were in a similar vein, featuring Kosher preparations for America classics such as Boston Cream Pie. The assimilation of Jewish immigrants through food seemed to be happening largely from 1900-1935 and it resulted in an unique cuisine that was simultaneously traditionally Jewish and modern American. Product cook books, like the one printed by Manischewitz, seemed especially intent on creating this modern, hybrid woman. 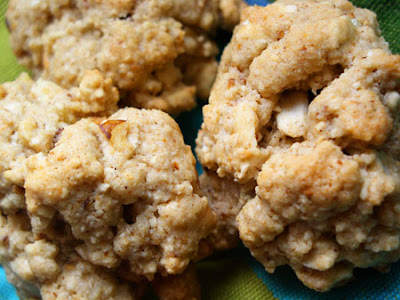 Yes, these cookies are made with “melted chicken fat.” Chicken cookies. 2. Cream together the schmaltz and the sugar. Add eggs one at a time, beating well after each one. 3. In a separate bowl, stir together cinnamon and matzo meal. With the mixer on low, slowly add the matzo meal. Mix until combined. 4. Stir in the walnuts and matzo farfel. Drop teaspoon sized lumps onto a greased or silicon cookie sheet. 5. Bake 15 minutes, or until bottoms are golden brown. Cool and enjoy. **note: I would recommend doubling the amount of walnuts (or raisins) and adding 3/4 salt to the matzo meal. My lips had never touched schmaltz until I moved to New York. Traditionally Jewish, it’s chicken fat, used to replace butter when necessary according to Kosher laws. It’s commercially available, but traditionally skimmed off the top of stock. I was having a hard time getting my hands on it in my largely Greek and Hispanic neighborhood. But fortune smiled, and while out on a video shoot, I brought up my search for schmaltz to food journalist (and schmaltz advocate) Josh Ozersky and chef Marco Canora of Hearth and Insieme. 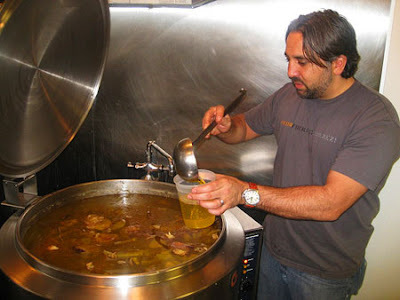 We were on our way to Insieme, when Marco mentioned he had just cooked up a pot of chicken stock, and would be more than happy to skim me some schmaltz from the top. I was beyond thrilled–looks like I owe Marco some Mock Oatmeal Cookies. Marco skims for schmaltz. What a great guy. Matzo Meal is ground Matzo; while Matzo Farfel is crushed or crumble Matzo. It’s worth it buying it in canisters as opposed to breaking up Matzo crackers. It’s cheaper and saves time. I mixed this recipe as I would a normal cookie dough, although this batter was definitely thinner. By mixing in the Matzo Farfel at the very end, it stayed crispier, and added more texture. I left out the raisins, because I hate fruit in my cookies. I sampled some of the dough before popping it in the oven: It had a disturbing chicken aftertaste. Left: Matzo farfel. Right: Mock Oatmeal Dough. A half hour was far too long a bake time for these cookies, and I burned my first batch. The second batch I baked 15 minutes, and they came out perfectly brown on the bottom. I offered one to my roommate without telling him what was in it. The verdict? Well, we both ate two. The chicken aftertaste had somehow baked away. They had a great texture, similar to a scone: crisp on the outside, and surprising soft and cake like on the inside, despite the lack of leavening. The matzo farfel really crunched and popped in you mouth. It would be a good cookie with a cup of coffee. I did find the cookies needed a bit of salt; I would probably add 3/4 tsp the next time I made them. Adding more walnuts wouldn’t have hurt either. In fact, I would make these cookies again. I think they’re made even more appealing because of their unique origins. Not bad for a cookie that started off smelling like chicken soup. Next week, Featherballs: a matzo ball seasoned with ginger or nutmeg, fried in schmaltz.